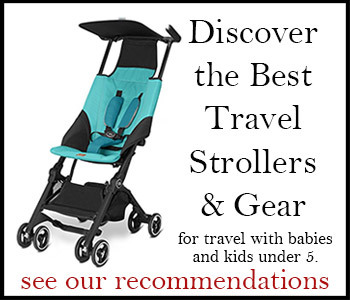 See recommendations for the best baby travel gear and other smart products for travel with toddlers and preschoolers. Includes single travel strollers and doubles + twins, plus stroller accessories. Travel bassinets, play yards, and helpful products for preschoolers. Shown: Phil & Ted’s Traveller Portable Travel Bed. Solutions to ease travel with a car seat. Travel-friendly alternatives to car seat for travel by plane and automobile. Shown: The Inglesina Fast hook-on table chair. You might also like our Pack This! continuing series of featured recommendations in the blog.